We are big Mercer Mayer fans at our house. Actually, I’ve been a fan since I was a kid. We collected the Little Critter books and I Was So Mad is still one of my favorites that I love to read all the time! 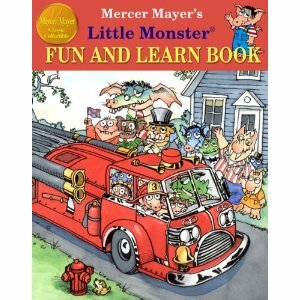 Little Monster Fun & Learn Book is a new collection featuring four of our favorite Little Monster stories..Counting, Alphabet, Bedtime, & Neighborhood. The illustrations are great as always and one reason these books appeal to me is even though they are geared towards ages 3-8, my little guy who is almost 2 can point out different words he is learning in the pictures – basketball, truck, apple, etc. There is a lot going on in each page to chat about! Alphabet ~ Ii is for insect. I have a pet ladybug and a cricket, but I don’t want a pet spider. Qq is for question. I collect questions to ask my Grandpa. Counting ~ 8 is eight ice cream cones. One cone fell on his head. How many are left? Neighborhood ~ The garbagemonsters pick up the garbage. Their truck grinds it up with a roar. Bedtime ~ Pop is reading monster rhymes tonight. When Humpty Dumpty fell off the wall, The Grithix couldn’t fix him at all. The Grithix got grumpy, but Humpty felt worse, So they went off together to find him a nurse. As you can see the stories are filled with Fun & Learning and a favorite for both the kids and me! I was sent this book for review and all opinions are my own. 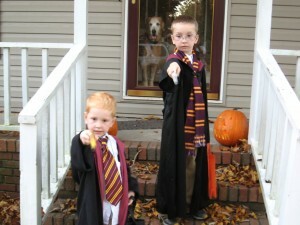 We are big Harry Potter fans at our house. Hubby and I have both read every book and eagerly watched each movie. The boys, especially my nine year old, are also Harry obsessed. They have the outfits, the wands, and the imagination to be wizards. 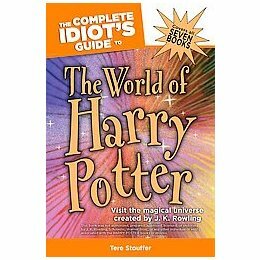 The Complete Idiot’s Guide to The World of Harry Potter by Tere Stouffer recently arrived at our house for us all to thumb through and read. We were excited to get started! C’Man wanted to start at the beginning, while I was happy to flip through and concentrate on sections that interested me most. About the author ~ Stouffer earned her Master’s degree in children’s literature at Hollins University. Her 2001 graduate paper detailing the differences between J.K. Rowlings’s magical world and those of C.S. Lewis and Lewis Carroll established her as one of the first Harry Potter Scholars in the nation. The boys quickly bookmarked Chapter 12 titled Watch What You Say: Spells, Charms, Hexes, Jinxes, and Curses. They are were always constantly asking me names of spells or going back to the movie to figure them out. They loved pointing their wands and shouting a spell at each other. Now they had information right at their fingertips! My favorite to use on them is Silencio! meaning silent. This charm may require a sharp poke from the wand, but that’s probably just to get the attention of the loud talker. Love it! I enjoyed reading snidbits on Quiddith, Hogwarts, Modes of Transportation, & even Herbology. But I also found it fun to read real life facts throughout the book based on King’s English words, Tourist Tips, and other Magic Tales that are facts that may compare Harry Potter to other imaginative worlds like Lord of the Rings or Narnia or even just how that magic word came about from history. This was a super fun read for anyone in the family and a must have for you Harry Potter fans! We received this book for review all opinions are our own.